The Osaki OS-4000T is a solid and reliable massage chair that is a fraction of the cost of premium chairs. Equipped with highly desirable features like Zero Gravity and Air Massage technologies and available at such an affordable price, it’s no wonder that it made it to our top 10 picks for best massage chairs. An upgrade of the Osaki OS-4000, the 4000T improves on the weaknesses we found in the 4000 model. 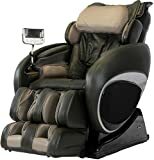 Titan World LLC is the maker of the Osaki series of massage chairs. Titan World is among the leading suppliers of handheld massagers, electric massage chairs, fitness machines, back relief products, and foot massagers. The main priority of Titan is to provide relaxation to the body in order to achieve an active lifestyle. The main body dimensions of the Osaki OS-400T are 52 L x 31 W x 34 H (Inches), and the vertical side is 38 L x 25 W x 15 H (Inches). The Osaki OS-4000T has a 3-year warranty. Computer Body Scan: The Osaki OS-4000T comes with computerized body scan technology that allows the rollers to map the curvature of your back. It provides accuracy that can help the chair combat all your aching joints, and fits to each user easily. No matter your body type, the Osaki OS-4000T is an advanced chair that can self-adjust to create the perfect massage for you. Unique Foot Roller: There are 2 rows of reflexology massagers placed on the bottom section of the chair that spin and provide a kneading sensation. When the rollers spin, they stimulate the acupuncture points in your foot. The airbags inflate and generate a deeper massage where you need it most. 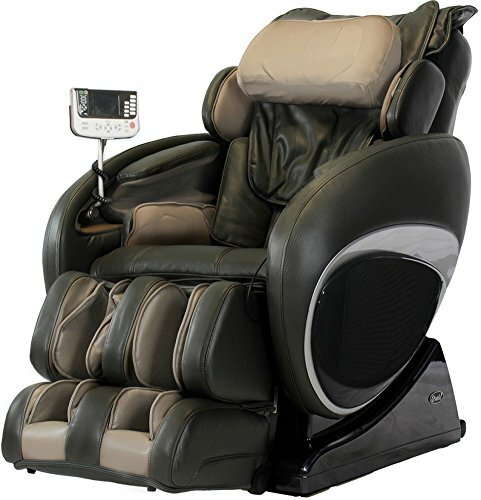 Zero Gravity Massage: The Osaki OS-4000T has a zero gravity massage mode that was inspired by NASA technology. The zero gravity position is the most efficient position to enjoy a massage – it helps improve spinal decompression, lessens muscle tension, improves spinal alignment, increases lung capacity, and decreases stress on the heart. This features has 2 stages, and the second is more reclined. Next Generation Air Massage Technology: The Osaki OS-4000T is a pioneer in massage chairs. It is efficient – the air massagers have been streamlined, saving energy. A lower number of air bags doesn’t mean you have to compromise on the quality of your massage – there is actually an increased surface area and volume! An efficient layout of working valves saves your chair by putting less stress on the mechanisms, too. The adage the proof of the pudding is in the eating can’t be much truer than for the 4000T. This particular Osaki model is truly comfortable and gives an excellent massage. All features deliver. Just by looking at the construction and design of this electric massage chair, it gives you the feeling that it can last you years and years. And this feeling is proven by reviews shared by satisfied buyers and users who have had their chairs for quite some time. It’s telling that it’s so hard to find negative feedback about this chair. We’ve said this of the earlier model and we’re saying it again, these models have very solid features. First off, a lot of these features were only previously available in high-end premium massage chairs. Secondly, they are assembled so well so that they always perform reliably. This makes them the perfect investment for your health and wellbeing. If you suffer from back pain, lower back aches, or any sort of muscle pain in your body, then you should definitely consider this massage chair as it has a proven track record for pain management. We definitely like the upgrades on the Osaki OS-4000T. Mechanical foot rollers – Unlike its predecessor, this model now has awesome foot rollers. If you like foot massages, then you’ll love the kneading massage the 4000T gives. It targets the acupoints in your foot and relieves tension and aches in your tired feet. Coupled with the calf and leg massages that this chair gives, you’ll definitely get a relaxing end-of-the-day treat. Improved synthetic leather – The new covering looks better, lasts longer, and cleans more easily. We didn’t give the Osaki 4000 a glowing review in the customer support department before. We’re happy to report though that recent interactions with the Osaki team have been highly satisfactory with individual customer agents going the extra mile to help out their customers. If you’re handy with a screwdriver though, the first problem appears to be easily fixed by moving the 3 mounting bolts on the shoulder panel area from the inner holes to the outer holes to create a bigger space. If you’re considering the Osaki OS-4000, then we’d highly recommend you fork out the extra cash and go for the 4000T instead. You’ll be thanking us in the years to come as you enjoy your upgraded hardware.